This is one of the world’s freakiest beaches. 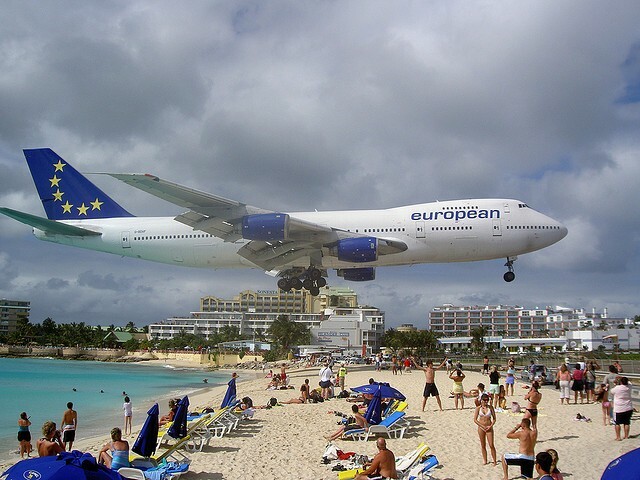 Maho Beach situated in the island of St Maarten looks beautiful with it’s Caribbean sand and sea but what happens above it is very strange. Every few minutes planes as large as 450 ton jumbos land and take off on the runway right beside the beach. With the planes flying just feet above the sunbathers’ heads. But if planes flying just above your head isn’t strange enough it has also inspired the freaky hobby of jet surfing. Extreme plane spotters clutch onto the airport’s perimeter fence and ride the waves of hot turbulent air streaming out of the back of the plane at speeds of up to 400 kilometres per hour. plane flying so close to us and the wind just might be the awesomest moment.